When looking for good gout diet foods to eat, do not forget the drinks. We all know that hydration is good for gout sufferers, but how about coffee – will it bring better hydration and lower uric acid? I have republished the following article as part of my ongoing website maintenance. 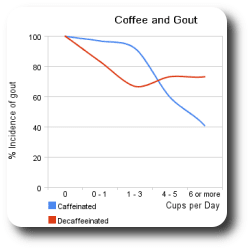 Coffee and gout will move to the Gout Diet Foods To Eat pages within the Gout Diet Section. The link between coffee and gout has been the subject of a number of gout and uric acid studies. There seems little doubt that there is a link, but more research is needed to try and determine just what that link is. 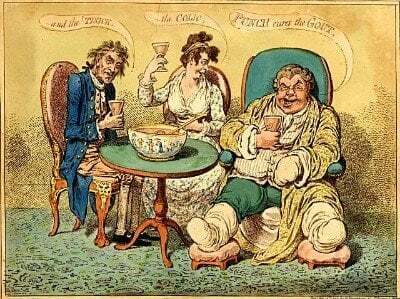 Like all statistical studies, gout sufferers need to be wary of the latest studies on gout and coffee. They only show that there is a statistical chance that drinking coffee will lower uric acid. Of course, lowering uric acid is vital to control gout, and so this research is vital. However, you should be most concerned with your own uric acid level and how you might reduce it below 6mg/dL (350 µmol/L) or even below 5mg/dL (300 µmol/L) if you have tophi, or a few years history of gout. Whether drinking coffee will do this for you depends entirely on your own circumstances. Frequent uric acid measurement will give you the best clue as to the effect of coffee on your own uric acid levels. Coffee Consumption and Risk of Incident Gout in Men compares the incidence of gout amongst men with different daily coffee consumption. The chart above shows the results of this study – a clear reduction in the percentage of gout sufferers with high coffee consumption compared to those with little or no coffee consumption. Remember that this does not mean that drinking coffee will cure your gout, just that if you drink coffee then, statistically, you are less likely to get gout. The authors point to an earlier study that, though based on a much smaller number of patients, helps to confirm a link between coffee and gout, and even suggests a possible explanation. Inverse association between coffee drinking and serum uric acid compares the average uric acid level amongst groups of men with different levels of coffee consumption. Again, this is a statistical study of groups of a number of individuals. It is not as meaningful as, say, a study comparing uric acid levels of individuals during periods of coffee consumption compared to periods without coffee. And, again, it does not mean that it applies to every individual. These findings suggest that coffee drinking may be associated with lower concentrations of serum uric acid, and further studies are needed to confirm the association. Coffee contains several species of xanthines other than caffeine [, e.g.] theobromine and theophylline … Allopurinol is one of the hypoxanthine isomers used as a drug inhibiting production of uric acid. Thus, it is possible that non-caffeine xanthines in coffee may have a similar effect on uric acid synthesis. Clearly, we need better specific studies to try and understand this link between coffee and gout. If you hear of any, or have opinions about these studies, please discuss them in the gout forum.